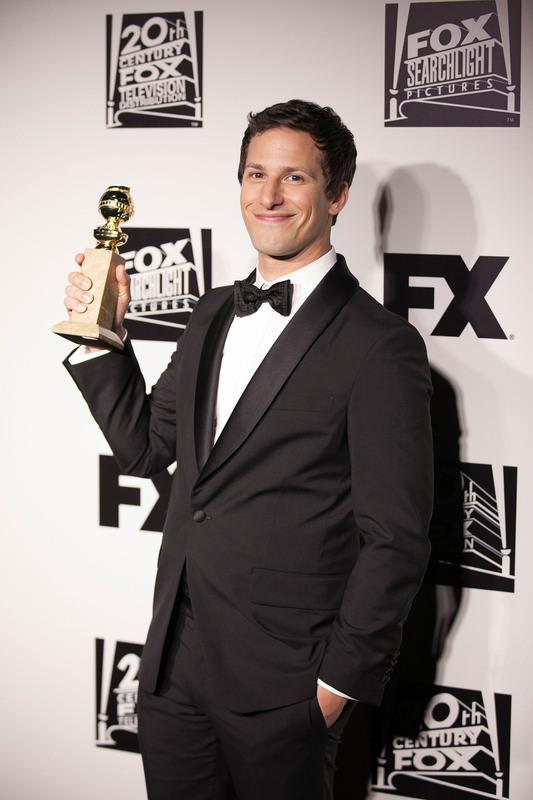 In some Golden Globes news that actually made me unabashedly happy, Brooklyn Nine-Nine took home the award for Best TV Comedy Series (petition for BK99 to do a musical episode), and Andy Samberg took home the prize for Best Actor! Squealing all the way to the bank, guys, and I'm going to take this opportunity right here and now to endorse Chelsea Peretti's Internet Presence for a Globes nomination next year, because her Instagrams from last night were a few highly curated shots. She posted an adorable, heart-melting photo of Samberg and his wife Joanna Newsom (yep, that Joanna Newsom) and some live-action shots of the pipe that burst on the red carpet (#humanexcrement). Yep, that's Chelsea Peretti (over-the-shoulder glance: straight out of Teen Vogue) and Andy Samberg (cranky trunk vampire boy) on the way to their 6th grade graduation. I could've used a friend like either of them during the misery of middle school. Just makes me love the show more. Ah, Peretti and Samberg for President.